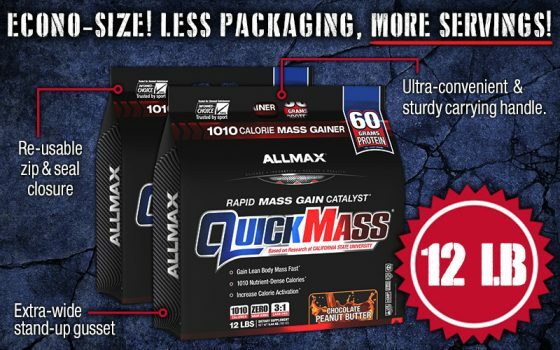 We have redesigned QUICKMASS to build on what was already an industry leading, technically superior formula. We’ve kept the same proven, researched based, 1010 calorie/60g protein per serving and we still have a superior complex carb blend to fuel your gains but now we’ve made it even better. Our 60g protein yield is 100% sourced from only the very best protein source – pure milk exclusively from U.S. dairy farmers. Our CARBPLEX carb blend has been improved to add healthier, long chain, complex carbs and it now has 60% less sugar. Even our absorption complex has been upgraded to improve absorption. While we were at it, we created the 5 best tasting flavors you’ll ever get in a mass gainer. QUICKMASS – a truly superior mass gainer, in every way. This means consuming a huge amount of quality calories. Simply put, if you’re not consuming more calories than your body is burning, you will not gain mass – you can’t argue with this fact! QUICKMASS works by providing a precise 1010 calories per serving (four scoops) with custom engineered nutrient matrices that set the gold-standard in mass gainers. 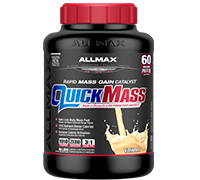 QUICKMASS is a scientifically formulated mass builder based on California State University research and is designed to help even the hardest gainer pack on lean mass quickly. This gold standard, 8-week, double blind, placebo controlled study showed an increase in chest size of 1 inch and 4.5 times as much lean muscle mass than the placebo group. QUICKMASS accomplishes this by combining a scientifically proven calorie level with a new calorie activation system called NP5™ Technology. Every angle of the QUICKMASS formula has been custom designed with the sole objective of delivering the strongest, most potent mass gainer in existence today! We at ALLMAX Nutrition feel we have accomplished our mission – you be the judge! 8 HR. SLOW-RELEASE CLEAN-CARB BLEND is critical to provide the fuel your body needs to grow, all day. CARBPLEX absorbs up to 20 times more slowly than sugar providing the ultimate MASS FUEL to fuel your gains! The QUICKMASS carbohydrate blend is powered by long-chain, healthy and complex carbohydrates such as sweet potato rolled oats and quinoa along with scientifically studied and tested carbs like Vitafiber. Provides a unique delivery matrix of 60 grams of sustained-release protein with 29 of those grams from Essential Amino Acids and of that nearly 14 grams of those are growth stimulating BCAAs – all of which are 100% naturally occurring within the protein! WHY IS QUICKMASS SUPERIOR TO ALL OTHER MASS GAINERS? 1. NP5 Calorie Activator: QUICKMASS is the world’s first and only calorie-activated mass gainer. Only team ALLMAX can bring you this exclusive compound! 2. Reduced Sugars: Many other weight gainers contain carbohydrates that are derived from sugar. QUICKMASS contains an exclusive carbohydrate complex called Carb-Plex that delivers just enough sugar to glycemically balance the matrix. 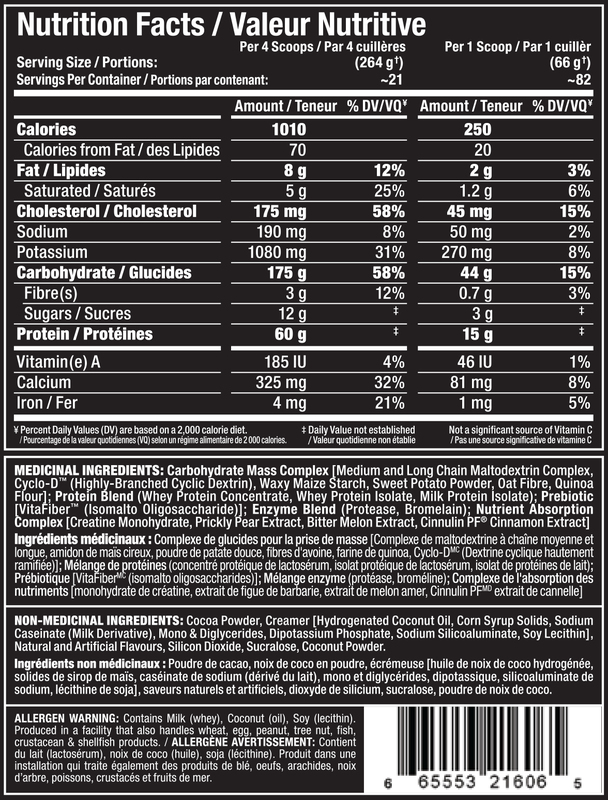 In fact, QUICKMASS contains only 3g of sugar per scoop! It also contains a blend of carbohydrates including high-molecular weight maltodextrin, sweet potato, quinoa and oat fiber to lengthen nutrient delivery and provide sustained levels of higher energy. 3. Zero Trans Fats: The saturated fat content in many other weight gainers is usually way too high. Not only does QUICKMASS has zero trans fats but it also contains Coconut oil powder, a valuable source of Medium-Chain Trigylcerides. 4. High Quality Protein: QUICKMASS combines a protein complex called MASS-PRO™ that delivers an Sustained-Delivery protein delivery matrix. 3 different forms of protein with high levels of both Essential and Branched Chain Amino acids combine to provide a longer more sustained delivery of protein to help you grow! 5. Real Science: QUICKMASS is supported by clinical research based out of California State University.